A plethora of research confirms why we, as music educators, should educate little ones. In 2015, a University of Queensland study found when a young child is engaged in music making with an adult (usually a parent), he or she benefits in the areas of attention regulation, acquisition of positive social skills as well as numeracy. Musical activities in this particular study included counting songs, improvising and creating new rhymes or words to a known songs as well as face to face interaction ie. singing to each other. These beginning musical activities, on a social level, engage children with their parents or caregivers and enhance emotional well-being. It is what happens in the brain, combined with an emotionally stable environment, which is important to the intellectual development of the child. Building neural pathways occurs from birth. Sensory stimulation is vital to enhancing brain cell connections. As children grow, hands-on, active engagement within a learning environment provides an ideal place for this to occur. As a male piano teacher of students from 6 – 12 years, I was terrified by the thought of teaching babies. Once I started however, I found that, not only did I really enjoy the teaching, I realised that I was effectively ‘growing’ my own students. Some of my best students have been the ones that I have taught since they were really little. Here’s a video of two of my students, Tom and Charlotte who I taught from ages 2 years and 9 months, respectively. Having the opportunity to teach a child right from their first years can have a huge impact on their abilities as musicians in the future. Giving them the right grounding in music can be the difference between students just having piano lessons for a few years and creating life-long music lovers and creators. Engaging a child in play through music is not only fun, it has the added benefit of removing screens and the internet for while. It is interesting that Steve Jobs limited the amount of technology his children used at home, but that’s a story for another blog post! Not only is teaching early childhood classes great for students, it can also be helpful for your bottom line. You might find teaching this age group a perfect opportunity to earn some extra income in the mornings when it is hard to get school-age piano students. You’ll also be able to enjoy the advancement of students, as they get older, into your other group and individual classes. Ellen discusses the advantages of this in this podcast. If you’ve taught students well as toddlers and they’ve been immersed in music since they were babies, they will have an excellent grounding in music as they start piano instruction. What is the best age to introduce children to music? The experts suggest: from birth or even before! Personally, I regularly have mums who come to my piano classes with their older children while they are pregnant with their next child. They sit in class and take part in the music learning process with their older children. When that child is born, I have seen the look of joy on the baby’s face when they come along with big brother or sister. Parents have said to me that their baby is most engaged whilst they are in the piano class. I have seen these babies not make a sound but just watch and listen to the older children. When that baby grows up and joins a class they often show lots of talent, usually singing in tune, playing and hearing music like it was a natural language. Anecdotally, those children who have experienced the music learning process “in utero” seem to enjoy that same music their older siblings learned, as well as learning very quickly. How to teach early childhood? The important thing to remember when teaching early childhood music is that children are hard-wired to seek sensory input. This means they need to have a multi-sensory learning experience. What ever you do needs to be visual, auditory, tactile (touch), proprioceptive (muscle & joint use ie. squeezing a ball, holding a percussion instrument or a beater, etc) and vestibular (how the head is positioned in space and the speed of body movement – it’s how we know where our body parts are when our eyes are closed). plenty of nursery rhymes and songs that you’re able to sing confidently and from memory. I remember when I started teaching this age group, I had to re-learn everything! As a piano teacher, you will need to change all your thought processes about educating the young, especially any traditional piano teaching philosophies. 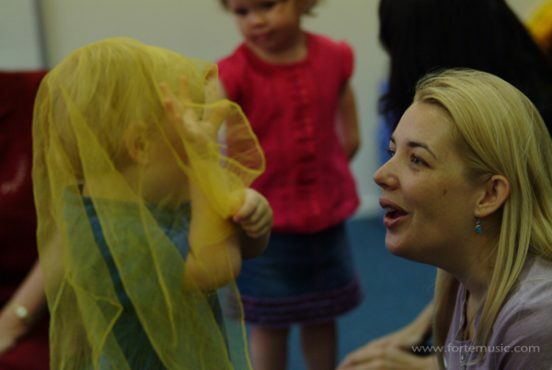 Start with an understanding of how children learn from a baby to 4 years of age. Find out about each stage of a child’s development during the initial four years of his/her life. This Victorian Govenment (AUS) website has some excellent resources about ages and stages of childhood development. Consider doing an Orff-Schulwerk course, a Kodaly course and there is an excellent workshop weekend held every year in Melbourne, Australia called ECCPA (Early Childhood Conference of the Performing Arts – run by VOSA). Also check out out recent podcast with Inner Circle member, Ellen Johansen on using the MusikGarten program for Early Childhood music as another opportunity for training. Volunteer to do some music classes at your local childcare or preschool. Any chance you have to engage with this age group will assist you in becoming a competent teacher. Once you’re equipped with some early childhood education knowledge and some experience it’s time to start exploring the teaching of these little ones! You’ll notice both the musical and non-musical activities ie. singing, playing percussion, as well as identifying colours and counting activities. You can see some of our other resources here. Joy Morin also has a great resource page for this age group at her colorinmypiano.com website. 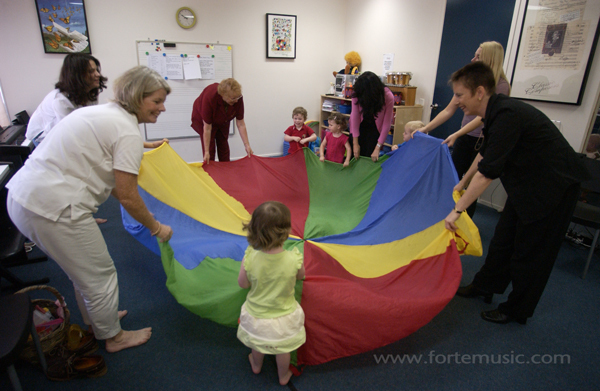 The Early Childhood Australia Shop also has a great resource called Music Magic – a music resource for ages 3 – 6 years. What Activities and Resources do you use? If you’ve had some experience in early childhood teaching, do you have any suggestions to add? What age would/could you like to start music lessons in your studio? What activities or resources have you found that worked really well?